Even though I’m not a Romney fan, I sometimes feel compelled to defend him against leftist demagoguery. But instead of writing about tax havens, as I’ve done in the past, today we’re going to look at incremental tax reform. The left has been loudly asserting that the middle class would lose under Mitt Romney’s plan to cut tax rates by 20 percent and finance those reductions by closing loopholes. That class-warfare accusation struck me as a bit sketchy because when I looked at the data a couple of years ago, I put together this chart showing that rich people, on average, enjoyed deductions that were seven times as large as the deductions of middle-income taxpayers. 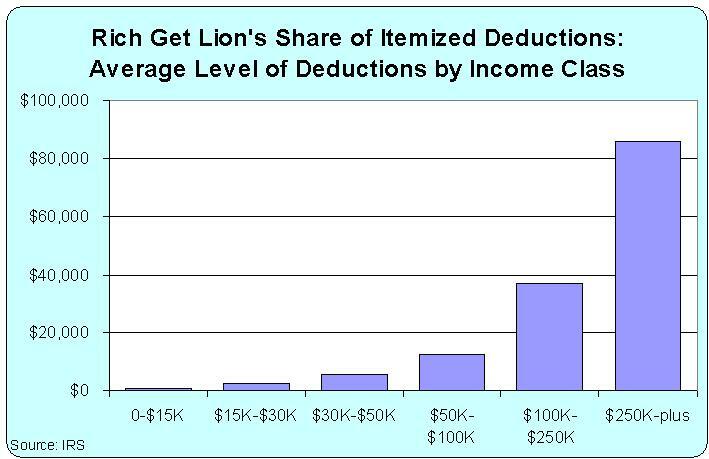 And the chart includes only the big itemized deductions. 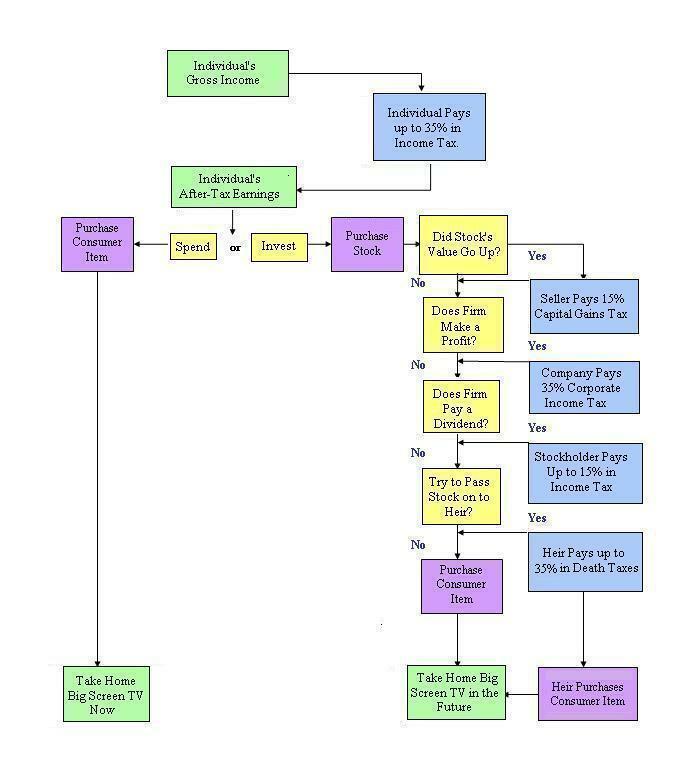 There are dozens of other special tax preferences, as shown in this depressing image, and you can be sure that rich people are far more likely to have the lawyers, lobbyists, and accountants needed to exploit those provisions. But that’s not a surprise since the internal revenue code has morphed into a 72,000-page monstrosity (this is why I sometimes try to convince honest leftists that a flat tax is a great way of reducing political corruption). But this chart doesn’t disprove the leftist talking point, so I’m glad that Martin Feldstein addressed the issue in today’s Wall Street Journal. Here’s some of what he wrote. The IRS data show that taxpayers with adjusted gross incomes over $100,000 (the top 21% of all taxpayers) made itemized deductions totaling $636 billion in 2009. Those high-income taxpayers paid marginal tax rates of 25% to 35%, with most $200,000-plus earners paying marginal rates of 33% or 35%. And what do we get when we apply a 30% marginal tax rate to the $636 billion in itemized deductions? Extra revenue of $191 billion—more than enough to offset the revenue losses from the individual income tax cuts proposed by Gov. Romney. …Additional revenue could be raised from high-income taxpayers by limiting the use of the “preferences” identified for the Alternative Minimum Tax (such as excess oil depletion allowances) or the broader list of all official individual “tax expenditures” (such as tax credits for energy efficiency improvements in homes), among other credits and exclusions. None of this base-broadening would require taxing capital gains or making other changes that would reduce the incentives for saving and investment. …Since broadening the tax base would produce enough revenue to pay for cutting everyone’s tax rates, it is clear that the proposed Romney cuts wouldn’t require any middle-class tax increase, nor would they produce a net windfall for high-income taxpayers. The Tax Policy Center and others are wrong to claim otherwise. In other words, even with a very modest assumption about the Laffer Curve, it would be quite possible to implement something akin to what Romney’s proposing and not “lose” tax revenue. This doesn’t mean, of course, that Romney seriously intends to push for good policy. I’m much more concerned, for instance, that he’ll wander in the wrong direction and propose something very bad such as a value-added tax. But Romney certainly can do the right thing if he wins. Assuming that’s what he wants to do. Just like he can fulfill his promise the reduce the burden of government spending by implementing Paul Ryan’s entitlement reforms. But don’t hold your breath waiting for that to happen. Is Mitt Romney a Keynesian? What is it about Mitt Romney? The United States desperately needs smaller government, lower taxes, and less intervention, yet his comments and track record on issues such as the value-added tax, healthcare, Social Security reform, budget savings, ethanol subsidies, and the minimum wage leave a lot to be desired. We can now add something else to the list. The former Massachusetts governor has come out of the closet as a Keynesian. This is worrisome, particularly since he is speaking extemporaneously and thus more likely to be letting us see his real views. But when I say something like that, it is also in the context of explaining the myriad ways that the economy benefits when a bloated public sector is pared back. And I like to think that I’m second to none in disseminating the medium-term and long-term advantages of less government. Mitt Romney, needless to say, doesn’t seem to fully share those views. For more information on this issue, here’s my take on Keynesianism. I made a snarky comment in a previous post that, “If the answer is bigger government, you’ve asked a very strange question.” I’m worried, though, that Romney doesn’t think that’s a joke. I’m perfectly willing to give my opponents credit when they do something clever and/or effective. I posted this video making fun of libertarians, for instance, because it is genuinely funny. People like me, I will confess, sometimes are so allergic to government that we do things that make us easy targets for satire. Well, here’s a video parody of Mitt Romney and the Cayman Islands, obviously designed to resemble the Corona beer commercials. I’m not impressed. My tepid reaction is not because I recently defended Romney’s use of Cayman-based investment vehicles. Indeed, here’s an old video attacking tax havens, and I think it’s sufficiently amusing that I just uploaded it onto my Youtube channel because it’s worth sharing and I couldn’t find it online. Both of these leftist videos make silly and inaccurate points, but the anti-Romney video is simplistic and the entire premise is false. He’s not hiding anything. Intelligent satire uses the truth as a starting point. This video doesn’t. The anti-Cheney video, by contrast, has some big mistakes, but at least it is based on the accurate premise that companies legally try to reduce their taxes. Moreover, the Jimmy Buffett music is a nice touch. Since I’ve share a couple of anti-tax haven videos, I feel compelled to post one of mine for some balance. And since I recently posted my video on the economic case for tax havens, here’s my video on the moral case for tax havens. And if you want to really understand these issues, I humbly suggest you look at the paper I wrote for the UK-based Adam Smith Institute. Sure enough, like the swallows returning to Capistrano, it’s happened. Two hacks at ABC News, Brian Ross and Megan Chuchmach, revealed (brace yourself for a real scoop) that Mitt Romney is a rich guy and some of his investments are based in funds domiciled in the Cayman Islands (gasp!). Wow, what a revelation! This must be Pulitzer Prize material. Pray tell, what wrongdoing did the story uncover? Well, let’s excerpt the key passages from the article. Mitt Romney has millions of dollars of his personal wealth in investment funds set up in the Cayman Islands, a notorious Caribbean tax haven. A spokesperson for the Romney campaign says Romney follows all tax laws and he would pay the same in taxes regardless of where the funds are based. …Romney has as much as $8 million invested in at least 12 funds listed on a Cayman Islands registry. Another investment, which Romney reports as being worth between $5 million and $25 million, shows up on securities records as having been domiciled in the Caymans. …Romney campaign officials and those at Bain Capital tell ABC News that the purpose of setting up those accounts in the Cayman Islands is to help attract money from foreign investors, and that the accounts provide no tax advantage to American investors like Romney. Romney, the campaign said, has paid all U.S. taxes on income derived from those investments. …Bain officials called the decision to locate some funds offshore routine, and a benefit only to foreign investors who do not want to be subjected to U.S. taxes. You’re probably thinking you missed something, because there’s nothing to the story. But that’s because the reporters don’t have anything. And if you think I excerpted unfairly, feel free to read the whole article. The only thing you’ll discover is that Ross and Chuchmach are biased hacks. Because not only did they write a story about nothing, they also quoted two left-wingers, Jack Blum and Rebecca Wilson, and failed to give the other side even an inch of column space. Blum is a former John Kerry staffer who is most famous for making unsubstantiated claims (which he later admitted were fabricated) that tax havens resulted in $100 billion of lost revenue to the Treasury each year. And Rebecca Wilson works for Citizens for Tax Justice, a union-funded group so radical that even congressional Democrats usually are reluctant to work with them. But what about the other side of the story? Did the article quote me, since I’ve been working on these issues for more than a decade? No. Did the article quote anybody from the Center for Freedom and Prosperity, the organization most active in the fight to defend low-tax jurisdictions? No. Did the article quote Richard Rahn, the Cato Institute Fellow who was a Board Member of the Cayman Islands Monetary Authority? No. Did the article quote any of the academic scholars who have written about so-called tax havens, such as Jim Hines of the University of Michigan or Andrew Morriss of the University of Alabama? No. Did the article quote Bob Bauman, the former Congressman and offshore expert who serves as Legal Counsel of the Sovereign Society? No. Fair and competent journalists would have done those things, but not the dynamic duo from ABC News. Yet what is “notorious” about being a prosperous multiracial society with living standards considerably above American levels? Moreover, Cayman has a tax treaty with the United States and an overwhelming share of the investment in the jurisdiction is completely legal institutional money – just like the Romney investment funds. But I guess a place like the Cayman Islands must be bad, at least to biased people from the press. After all, a place with no income taxes, no capital gains taxes, no payroll taxes, and no death taxes must be condemned. I’m not a Romney fan, as you can see by reading this post, but I believe in honest and intelligent debate. Too bad ABC doesn’t. I’m not a big fan of Mitt Romney. I hammered him the day before Christmas for being open to a value-added tax, and criticized him in previous posts for his less-than-stellar record on healthcare, his weakness on Social Security reform, his anemic list of proposed budget savings, and his reprehensible support for ethanol subsidies. But I also believe in being intellectually honest, so I’ll defend a politician I don’t like (even Obama) when they do the right thing or when they get attacked for the wrong reason. In the case of Romney, some of his GOP opponents are criticizing him for job losses and/or bankruptcies at some of the companies in which he invested while in charge of Bain Capital. But I don’t need to focus on that issue, because James Pethokoukis of AEI already has done a great job of debunking that bit of anti-Romney demagoguery. In this post, I want to focus on the issue of tax havens. Regular readers know that I’m a big defender of these low-tax jurisdictions, for both moral and economic reasons, and I guess that reporters must know that as well because I’ve received a couple of calls from the press in recent weeks. But I suspect I”m not being called because reporters want to understand international tax policy. Instead, based on the questions, it appears that the establishment media wants to hit Romney for utilizing tax havens as part of his work at Bain Capital. As far as I can tell, none of these reporters have come out with a story. And I’m also not aware that any of Romney’s political rivals have tried to exploit the issue. But I think it’s just a matter of time, so I want to preemptively address this issue. So let’s go back to 2007 and look at some excerpts from a story in the Los Angeles Times about the use of so-called tax havens by Romney and Bain Capital. There are a couple of things worth noting about these excerpts. 1. Nobody has hinted that Romney did anything illegal for the simple reason that using low-tax jurisdictions is normal, appropriate, and intelligent for any business or investor. Criticizing Romney for using tax havens would be akin to attacking me for living in Virginia, which has lower taxes than Maryland. 2. Jurisdictions such as Bermuda and the Cayman Islands are good platforms for business activity, which is no different than a state like Delaware being a good platform for business activity. Indeed, Delaware has been ranked as the world’s top tax haven by one group (though American citizens unfortunately aren’t able to benefit). 3. America’s corporate tax system is hopelessly anti-competitive, so it is quite fortunate that both investors and companies can use tax havens to profitably invest in the United States. This helps protect the American economy and American workers by attracting trillions of dollars to the U.S. economy. These three points are just the tip of the iceberg. Watch this video for more information about the economic benefit of tax havens. Last but not least, here’s a prediction. I think it’s just a matter of time until Romney gets attacked for utilizing tax havens, though the press may wait until after he gets the GOP nomination. But when those attacks occur, I’m extremely confident that the stories will fail to mention that prominent Democrats routinely utilize tax havens for business and investment purposes, including as Bill Clinton, John Kerry, John Edwards, Robert Rubin, Peter Orszag, and Richard Blumenthal. It’s almost enough to make you think this cartoon is correct and that the establishment press is biased. This is why there is a desperate need to reform programs such as Medicare and Medicaid. But politicians almost certainly won’t adopt the needed reforms if they have the ability to instead confiscate more money from taxpayers – especially if they have a new tax like the VAT, which is a money machine for bigger government. Ironically, it appears there’s more danger of that happening with Romney in the White House.